How can organisations involved in urgent and emergency care work better together to provide consistently safe, quality care? This was the issue discussed at the fourth #ProjectA tweet chat on the evening of 15 August. You can read more about the themes and ideas in the tweet chat report. If you have an idea about helping improve the ambulance service please do have your say. Everyone is welcome to join in the conversation - even if you don't have a new idea to add, you can vote on an existing idea, or write a comment on a thread. 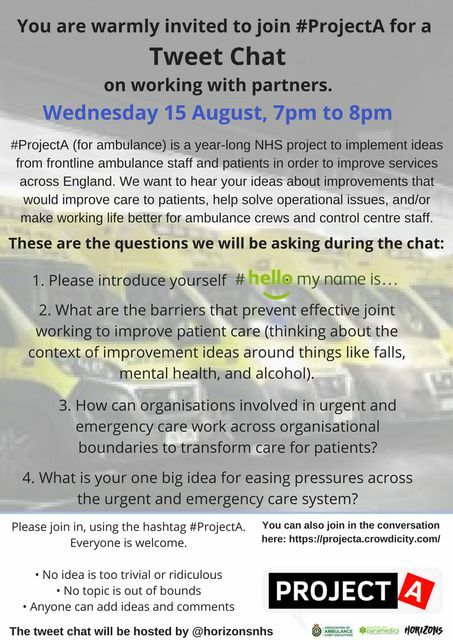 The fifth and final of the #ProjectA tweet chats will take place on Tuesday 21 August from 7pm to 8pm, and is about thinking the unthinkable. Everyone is welcome - we hope to see you there! You can also catch up with the first tweet chat - about partnerships with patients and the public; the second, which was about patient pathways; and the third, which was about wellbeing. #ProjectA was initiated by Simon Stevens, the Chief Executive of NHS England, after he spent time with ambulance crews in London and the Midlands. Simon identified the potential for frontline ambulance staff to play a much bigger role in innovation, service redesign and problem solving. He has asked the NHS Horizons team to work with the Association of Ambulance Chief Officers (AACE) to develop a year-long initiative that supports and builds on the excellent work that is underway in many parts of the system and builds on the ideas and energy of frontline ambulance staff. The ambition is to identify at least four major change ideas that can be developed, prototyped and implemented by frontline staff across all ten ambulance trusts, in time to start making a difference in winter 2018/19. The whole ethos and approach of #ProjectA is one of co-production and collaborative decision making.